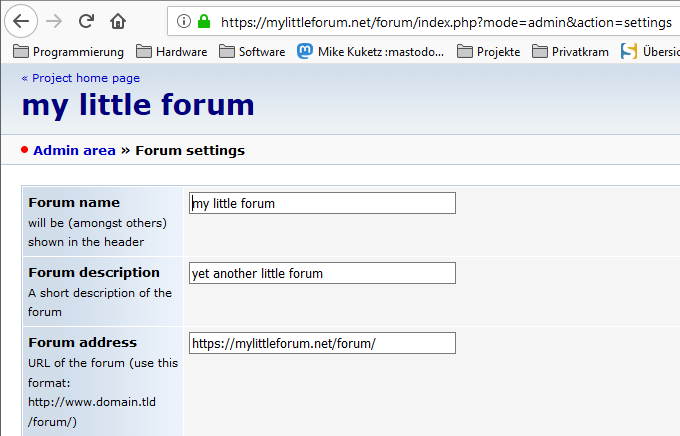 Doing what you said makes the Forum settings link work but the language is on Chinese and every text field is empty then clicking on advanced settings goes to an empty page with just an ok or submit button. I updated the project forum before I wrote the former posting. I tested the result and I saw the settings page and it looked as intended and it do it also now (screenshot taken at 2019-02-07 13:46 UTC). The settings array was renamed in version 2.4.19 from $settings to $edSet in the script (admin.inc.php) and in the HTML-template admin.inc.tpl for the settings section. There is the user edit section where $settings is still in use! … the template is outdated.